THE DOLPHINS in Florida did us proud again. One of our fellow cruisers – who lives at North Port – said that this was her sixth time out on the boat and that she has yet to not see Dolphins. While there is no guarantee that you will get a display such as this shown in our video, but it’s well worth booking a trip. DO YOU always end up taking far too much stuff on holiday? 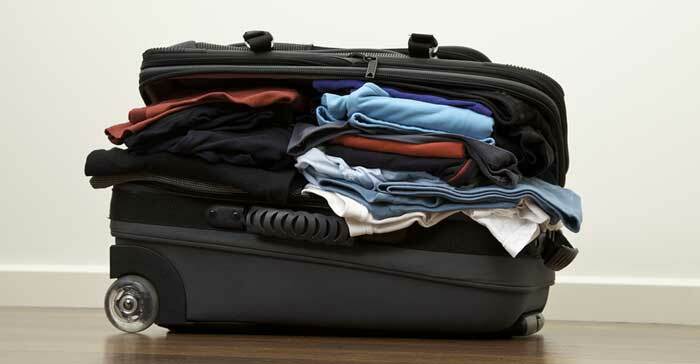 It’s easily done, so here’s some great advice from Holiday Extras on packing. Holiday Extras, by the way, is a great site for booking airport parking, pre-flight hotels, coach transfers, executive lounge, airport shuttles – in fact anything connected with your holiday travel arrangements. Are you guilty of packing any of these things? Holiday packing is a fine art that demands skill and patience – and few of us get it completely right. But years of bitter experience have taught us that it’s often not what we forget to pack that causes us a headache on holiday – it’s the things we do bring, but don’t really need. Read on for some no-nonsense advice on what not to pack. Holiday packing is no time to succumb to Imelda Marcos syndrome. While we recommend packing a pair of shoes for every occasion, think carefully about how many situations you’re likely to find yourself in on your trip. For many, it’s as few as three: beach, night out, walking in town. Add in another pair if you’ve got a particularly active trip in mind (walking boots, trainers or hiking shoes for example) and you’re up to an absolute maximum of four pairs. You can always stock up on inexpensive sandals or flip-flops if your footwear lets you down. Holidays are a time to let your guard down, so if you’re lucky enough to own jewellery worth thousands of pounds, you probably won’t want to run the risk of losing it or having it taken off you on your travels. There are also all kinds of situations you’re likely to encounter on holiday that could be damaging to fine and delicate jewellery, such as sea water, chlorine and all sorts of outdoor activities. Bag yourself some cheap and cheerful costume jewellery, and accessorise with peace of mind. Feel free to ignore this section if you’re a keen photographer looking to make the most of your hobby while on holiday, but nowadays many travellers find that all they need for decent quality holiday snaps is a compact digital camera, or even their smartphone. There’s no need for multiple lenses and tripods unless you really are determined to nail that award-winning sunset shot.